The right kitchen utensils can make all the difference. Everyone hates to start a recipe and find their knife or vegetable peeler is dull, or that their can opener no longer cuts the mustard, let alone aluminum! 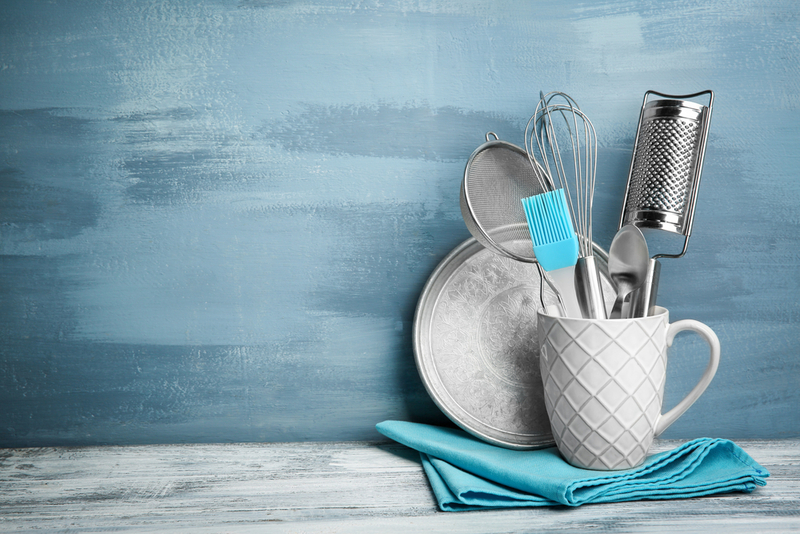 There’s no need to have overflowing kitchen drawers if you have a solid supply of good multitasking utensils like those in our must-have list. We recommend commercial, foodservice quality utensils because they’re made to a higher standard to withstand daily wear-and-tear in a restaurant environment. This means they’ll last for ages in a home kitchen if they’re handled with care. Stock your kitchen with these hard-working basic utensils, and you’ll avoid a lot of meal-prep frustration! Ice cream scoop. A strong, basic scoop is a major time-saver, and definitely not just for scooping ice cream. The one we sell is sized to make scooping cookie dough a breeze. It’s also helpful for filling muffin tins with batter or portioning mashed potatoes. Ladle. It’s a basic tool, but so helpful for spooning soups and gravies. We keep a couple sizes on hand. Parchment Paper. If you’ve been baking without parchment paper, you’re missing out…and we’re sad for you! Parchment Paper is the tool you didn’t know you needed. It keeps pans clean, keeps foods from sticking, makes a clean prep surface, and has so many other handy uses. It’s become a staple in our kitchens. Can Opener. It’s likely one of the most unappreciated tools in your kitchen, but when it doesn’t work well it’s so. frustrating! Treat yourself to a new, sturdy model if yours isn’t the sharpest tool in the drawer these days. Potato Masher. If you’re a potato lover like we are, then we won’t need to explain this one. Using a masher helps your potatoes stay fluffier and lighter compared to other methods of mashing. And we all love fluffy potatoes. Vegetable Peeler. This is another utensil that may be due for an upgrade in your kitchen. A sharp vegetable peeler helps get the job done well and fast! Meat Thermometer. If you ever have a hard time knowing when your meat is cooked all the way through, this is just the thing for you! They’re so handy and don’t take up much space. We never knew we needed one, and now we will never be able to go without! Breakfast/Tortilla Pan. We all need a good pan, and this one is perfect for all your breakfast needs! It even has sloped sides make for easy flipping! Apple Peeler Corer/Slicer. Cutting apples has never been easier! We love our apple peeler corer/slicer for apple desserts, or to quickly cut apples for our little ones. Cutting Mats. Whether it’s a cutting board or cutting mat, it’s an essential basic tool in our kitchens to make clean up easy, and protect our beloved countertops! Whisk. We’ve all tried whisking recipes with a fork, but get a whisk to give your arms a little break! Another kitchen basic, that is so helpful when making breads, desserts, or gravies. Citrus reamer (Or grapefruit spoon). Getting through an orange peel with your fingers is quite a task, and leaves your fingers stained. A citrus reamer or grapefruit spoon will save you such a hassle and get you every last bit of your delicious fruit! Mixing Bowls. Mixing bowls are towards the end of this list, but the top of our kitchen essentials. We never seem to have enough bowls, which is why we love this set! Game.changer. Basting Brush. A basting brush is not likely to be on the list of most of our must-have lists, but they are so handy! Whether for making a Gourmet pizza or basting poultry, they are so nice to have in our kitchens. Cookie Sheet and Cover. If you don’t have a cookie sheet, trust us when we say you are missing. out! They are so nice to have on hand for cookies (duh), chicken nuggets, pizzas, or practically anything else you can think of! This is one of our most loved kitchen items. The covers make transporting cakes or other foods to parties!